As a child, Minga learned how to care for the special things in life. 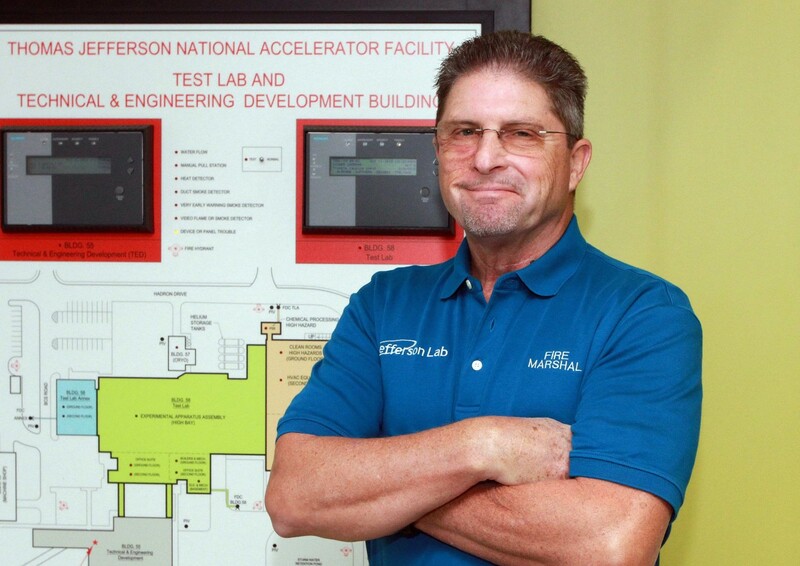 Now, as the first Jefferson Lab Fire Marshal, he cares for myriad buildings and staff. When Timothy Minga was a little boy, growing up the middle child in a family of three sons in rural Smithfield, he would sometimes leave his bicycle in the front yard. But his grandfather, an oysterman who lived across the street, wanted to impress upon his grandchildren the importance of taking care of what you have; taking care of what is special. “If he thought for one minute that my bicycle was going to stay in the front yard and not be put in the garage, he would call the house,” Minga said. “I know you’re not going to leave that bicycle in the front yard,” Minga said, reenacting his grandfather’s teaching words. “‘No sir, no sir,’ and I’d run outside and put the bicycle back in the garage,” Minga said. But the lesson, Minga recalls, has stuck with him for life. Minga who now serves as Jefferson Lab’s Fire Marshal, has built a career taking care of what is special. “I have always been passionate about life safety,” Minga said. When he was 18 years old, Minga joined the Smithfield Volunteer Fire Department. As a teenager, Minga was one of the working firemen to run into the burning Smithfield Packing Co.’s smokehouse when it went ablaze. Minga’s desire to save lives pushed him onward. From running into burning buildings to rising through the ranks and dedicating his career to preventing fires, Minga faces challenges with determination. Seeing Minga’s potential during his time as a volunteer firefighter, his chief sent him to the University of Georgia at the age of 20 to further his studies on fire investigation, detection and suppression. “That’s when everything took off,” Minga said. Minga worked his way through the ranks, landing himself a position in the Newport News Fire Marshal’s office, where he worked as a Fire Inspector, Assistant Fire Marshal, Criminal Investigator and Deputy Fire Marshal. It was with this mentality that Minga began working on the Jefferson Lab Experimental Hall D project as a Fire Marshal representing the City of Newport News. With his retirement date approaching, Minga applied to continue his work with Jefferson Lab, and eight years ago, he joined the team working on the Fire Protection Program. He was recently promoted to Fire Marshal, where he leads a Suppression Technician and Detection Technician to ensure all systems are tested, maintained and properly working. As a team of three, their responsibilities include testing and maintaining fire alarm systems and sprinkler systems, as well as completing assessments that ensure compliance with the Department of Energy’s requirements. Being adaptable and ready for anything is part of the job requirements. Working with an active laboratory, where experiments are constantly changing, requires the fire suppression and detection systems to change. Minga has to assess whatever new potential dangers may be involved with that experiment and design a system prepared for any unplanned circumstances. Balancing the experimental side with the daily care and maintenance of the entire facility, Minga and his team never rest at work. When he isn’t working, Minga enjoys spending time with his family. A father to three children, one son and two daughters, and a partner to his wife, Minga enjoys spending time on the water. “I have had a boat and lived on the water all of my life,” Minga said. A family man who built his career on the foundation of saving lives, Minga hopes to be remembered as a hardworking man who loved his family on and off the water.